The incredible stories that fill our lives are what makes the celebation complete. 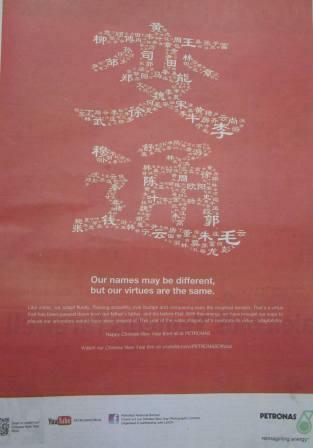 Petronas: Our names may be different, but our virtues are the same. Like water, we adapt fluidity. Flowly smoothly over bumps and conquering even the roughest terrains. That’s a virtue that has been passed down from our father’s father, and his before that. With this energy, we have bought our ways to places our ancestors would never have dreamt of. 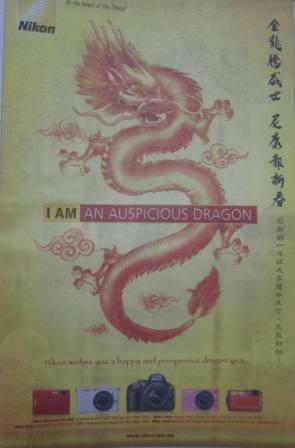 This year of the water dragon, let’s celebrate its virtue- adaptability. Happy Chinese New Year from all at PETRONAS. Watch our Chinese New Year film on youtube.com/PETRONASOfficial. TM (Telekom Malaysia) : Celebraterwith prosperous New Year with family and friends, no matter where you are. Stay connected and share the good fortune of the Dragon. 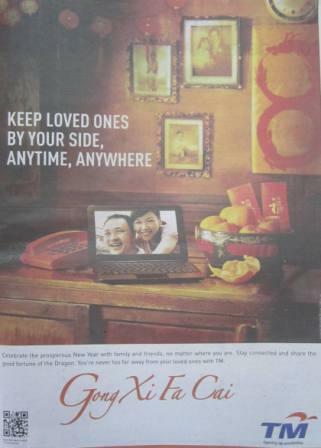 You’re never too far away from your loved ones with TM. Every careful turn, every attention to detail is important to create a beautiful work of art- just as precision, strategy, and timing are essential to the development of a company with a heritage as rich as Sime Darby’s. We’ve grown from our humble beginnings in Malacca in 1910 to the country’s largest diversified multi-national based on the hard work and dedication of our 100,000 employees in more than 20 countries. Our success is demonstrated by the fact that more than a 100 years after we were founded in a tiny estate in Malacca, we continue to contribute to the sustainable development of our country and our people. Wishing all Malaysians a Happy and Prosperous Chinese New Year. 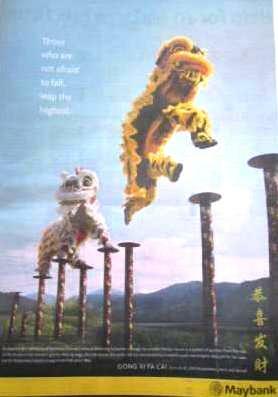 Maybank: Those who are not afraid to fall, leap the highest. Its dance is the heartbeat of the brave; its every jump, a testament to human courage. 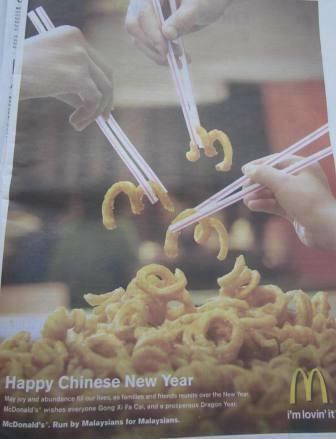 No wonder the lion dance is a symbol of sucess. From the roar of the drums to the dancers’ gravity-defying leaps, the lion moves the world. We too are constantly moved to scale new heights. Not just for our sake, but for those who helped us leap in the first place. You. 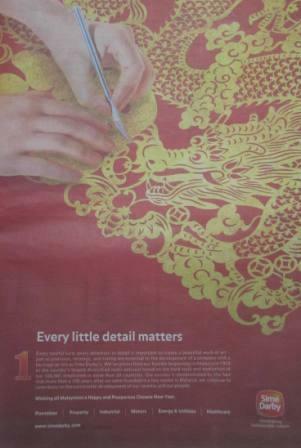 Gong Xi Fa Cai from all 45,000 Maybankers here and abroad. 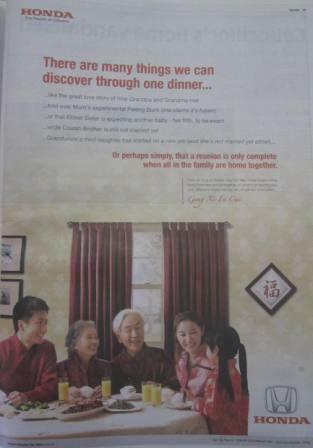 Or perhaps simply, that a reunion is only complete when all in the family are home together. From all of us at Honda, may the Year of the Dragon bring family from near and far together, to usher in an aspiring new year. Wherever home may be, we will get you there safely. 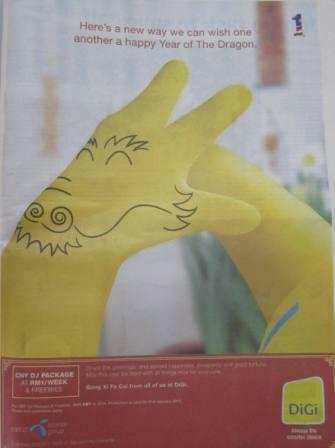 Digi- Here’s a new way we can wish one another a Happy Year of the Dragon. 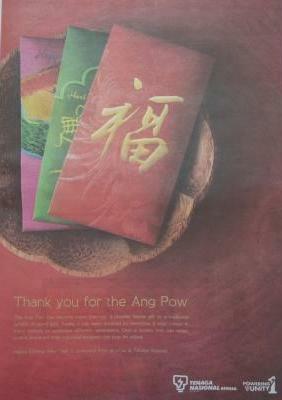 Tenaga Nasional: Thank you for the Ang Pow. 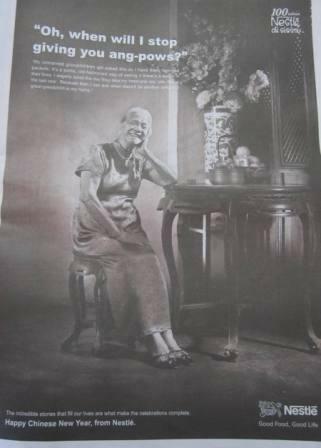 The Ang Pow has become the more than just a Chinese festive gift or a traditional symbol of good luck. Today, it has been adopted by everyone. It now comes in many colours to symbolise different celebrations. Only a society that can adapt, evolve and share their individual traditions can truly be united. 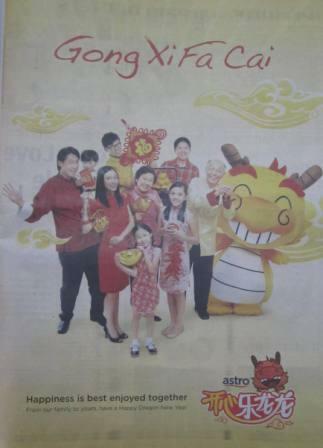 Happy Chinese New Year to everyone from all of us at Tenaga Nasional. 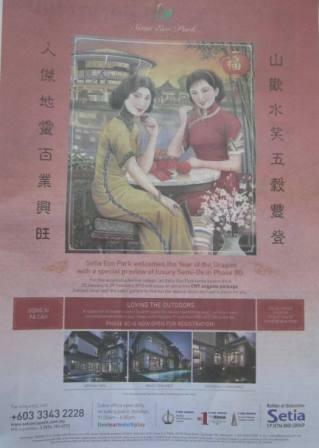 Above is by SP Setia- I like their design – mix of old (ladies in traditional outfit) and behind, the developed building. Above is the advertisement by Nikon.